He just wants to shake, shake, shake, shake, shake, shake it off! 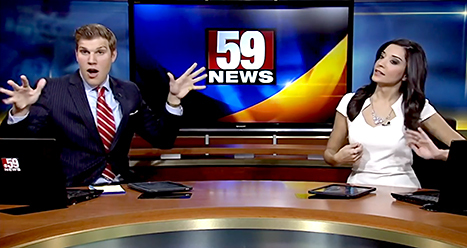 West Virginia news anchor Dan Thorn has become a viral sensation thanks to his dance breaks at his desk for CBS 59. The New York native joined the news team in February 2013, according to the channel’s website, but clearly his co-anchor Sarah Pisciuneri hasn’t warmed up to him yet. In a series of YouTube videos, Thorn dances to T.I.’s “Where They At Doe,” Taylor Swift’s “Shake It Off,” and James Brown’s “I Got the Feeling.” Pisciuneri sits beside him, doing her best to ignore the goofy reporter, while occasionally looking up to throw buckets full of shade at him. News anchor Dan Thorn dances to songs while on break as his co-anchor Sarah Pisciuneri looks on. “I can’t dance on camera,” she replies, stone-faced. Watch the clips and tell Us what you think!